Andrea had a doctor appointment yesterday and her blood pressure continues to be high. She is now on blood pressure medicine and will have bi-weekly doctor appointments. She will continue to be on bed rest and have bi-weekly non stress tests. Yesterday she was dilated to 1 cm and 50% effaced. The doctor was hoping she was 2-3 cm dilated so she could induce her. Andrea has her next doctor appointment on Tuesday and the doctor said she might induce as early as next week, depending on cervix changes. We can't believe this baby will be here in 1-2 weeks. We'll keep you posted! 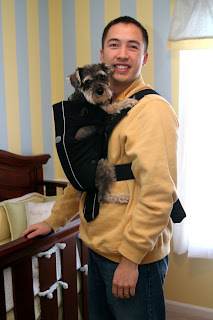 Here's a picutre of Shawn trying out the Baby Bjorn, with Chloe's help.